Lemuria, the lost continent of the Pacific, has been discussed in nineteenth- and twentieth-century occult literature as the Pacific equivalent of Atlantis. It is distinct, however, in that it is a completely modern invention, having originated in the middle of the nineteenth century as a means to solve some problems of biology. Biologists had noted the existence of very similar flora and fauna in southern India and Ceylon (now Sri Lanka) and southern Africa. The problem was that these species did not exist on the lands between. Before scientists had arrived at an understanding of continental drift, Philip L. Schattler proposed the idea of a land bridge between southern India and southern Africa. The lemur was a prominent animal whose habitat was being researched, and Schattler gave thename Lemuria to his hypothesized land bridge. The idea was quickly adopted by a number of biologists, including Ernst Haekel (1834–1891), who further hypothesized that Lemuria was the home of the missing original hominoids. (Many yet-tobe-discovered skeletons would point in different directions.) By the 1880s, the lost continent of Lemuria would be an honest (if soon-to-be-discarded) scientific theory. In the 1880s, however, Helena Petrovna Blavatsky, cofounder and major theorist of the Theosophical Society, integrated the idea of Lemuria into her understanding of human evolution. Humans evolved through a series of root races, she said. She claimed that the contemporary Anglo-Saxons were the fifth root race. The two previous root races had emerged on Atlantis and Lemuria, respectively. Blavatsky’s account of Lemuria led to further discussion in the theosophical writings of Charles W. Leadbeater and to the major book, The Story of Atlantis and the Lost Lemuria, by W. Scott-Elliot. What had started as a hypothetical land bridge between Africa and India had become a sizable continent stretching from India to New Zealand. Australia was a remnant and the Aborigines were descendants of the continent’s dwellers. Lemuria was soon identified with the lost continent of Pan described in Oahspe: A New Age Bible, a channeled text from the hand of Spiritualist John B. Newbrough. Pan was said to be a large continent located in what is today the north Pacific. Pan’s remnants theoretically included the western coast of California, whose unique flora and fauna were another problem for nineteenth-century biologists. A third source of speculation on Lemuria derives from the work of Augustus Le Plongeon, an archaeologist working in the late nineteenth century in Central America. At the time, the Mayan hieroglyphs in the Yucatán had not been deciphered, but Le Plongeon claimed significant progress in that regard. He suggested that the writing at Chichen Itza told the story of a princess Moo and an ancient continent to the east (Atlantis) that he called Mu. He presented his findings in 1896 in a book, Queen Moo and the Eqyptian Sphinx, but after he was given a brief hearing before his archaeological colleagues, his ideas were dismissed. Le Plongeon would be long forgotten if his papers had not passed to one James Churchward (1832–1936). Churchward claimed to have seen what he called the Naacal tablets, a set of materials written in the lost Naacal language. The tablets told the story of a lost continent in the Pacific as described by a few of the survivors of the continent’s fiery destruction. Churchward claimed to have seen the tablets in India, but no one else to the present day has ever seen them. Combining the Le Plongeon material with stories of the Naacal tablets in his 1926 book The Lost Continent of Mu, Churchward proposed the idea of a huge continent in the Pacific south of Hawaii. The notions about Lemuria, Pan, and Mu were melded in the 1931 Rosicrucian classic, Lemuria: The Lost Continent of the Pacific. 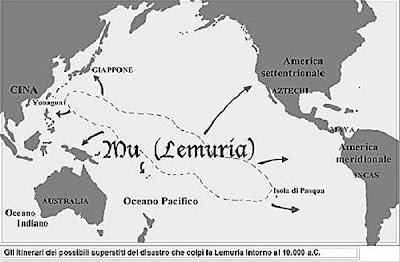 According to H. Spencer Lewis (writing under the pen name Wishar S. Cerve), Lemuria was a mid-Pacific continent. When it was destroyed, a sliver of it was jammed against North America and became California. It is especially associated with Mt. Shasta, a prominent volcano in northern California that has become the focus of occult speculation in its own right. Five years after Lewis’s book was published, the Lemurian Fellowship, a theosophical occult group, was founded in Chicago. Its leader, Robert Stelle, expanded on the now-entrenched occult myth in two books, An Earth Dweller Returns (1940) and The Sun Rises (1952). In the last generation Lemuria has become a standard part of New Age mythology and is frequently mentioned in channeled literature. Among the interesting twists on the idea of Lemuria is that attributed to ‘‘Ramtha,’’ the entity who speaks through J. Z. Knight. ‘‘Ramtha’’ says he was a Lemurian. Lemuria, according to ‘‘Ramtha,’’ was not a separate continent but a section of the ancient continent of Atlatia (as he calls Atlantis). An initial cataclysm, some thirty-five thousand years ago, destroyed the northern half of the continent, including Lemuria. Survivors found shelter in Onai, the great port city of Atlatia. ‘‘Ramtha’’ says he was born of a Lemurian mother who had escaped to Onai. Blavatsky, Helena P. The Secret Doctrine. 2 vols. London: Theosophical Publishing, 1889. Cerve, Wishar S. [H. Spencer Lewis]. Lemuria: The Lost Continent of the Pacific. San Jose, Calif.: Supreme Grand Lodge, AMORC, 1931. Churchward, James. The Lost Continent of Mu. New York: Ives Washburn, 1926. Le Plongeon, Augustus. Queen Moo and the Egyptian Sphinx. New York: The Author, 1896. Melton, J. Gordon. New Age Encyclopedia. Detroit: Gale Research, 1990. Walton, Bruce, ed. Mount Shasta: Home of the Ancients. Mokelume Hill, Calif.: Health Research, 1985.